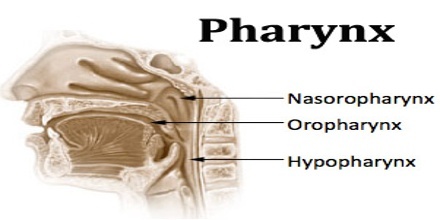 Pharynx is the passage that leads from the cavities of the nose and mouth to the larynx (voice box) and esophagus. Air passes through the pharynx on the way to the lungs, and food enters the esophagus from the pharynx. The pharynx serves as a vestibule or entryway for the trachea and esophagus. 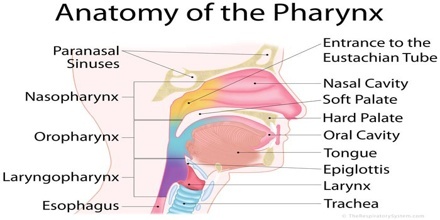 The word pharynx (pronounced /ˈfærɪŋks/) is derived from the Greek φάρυγξ phárynx, meaning “throat”. Its plural form is pharynges /fəˈrɪndʒiːz/ or pharynxes /ˈfærɪŋksəz/, and its adjective form is pharyngeal (/ˌfærɪnˈdʒiːəl/ or /fəˈrɪndʒiəl/). In humans the pharynx is part of the digestive system and also of the conducting zone of the respiratory system. It makes up the part of the throat situated immediately behind the nasal cavity, behind the mouth and above the esophagus and larynx. The human pharynx is conventionally divided into three sections: the nasopharynx, the oropharynx and the laryngopharynx. It is also important in vocalization. Nasopharynx (Nasal Pharynx) – It is the uppermost section, located between the skull base and the soft palate. The adenoids or pharyngeal tonsils are located on its posterior wall. Oropharynx (Oral Pharynx) – The part after the nasopharynx, the oropharynx is the region behind the base of the tongue, between the soft palate and the epiglottis. Laryngopharynx – Also known as the hypopharynx, it is the last section of the pharynx, located between the epiglottis and the cricoid cartilage, continuing into the larynx and esophagus. The vascular supply to the laryngopharynx includes the superior thyroid artery, the lingual artery and the ascending pharyngeal artery. The primary neural supply is from both the vagus and glossopharyngeal nerves. Triangular-shaped recesses in the walls of this region house the palatine tonsils, two masses of lymphatic tissue prone to infection. The isthmus connecting the oral and nasal regions is extremely beneficial in humans. Pharynx chamber serves both respiratory and digestive functions. Thick fibres of muscle and connective tissue attach the pharynx to the base of the skull and surrounding structures. Both circular and longitudinal muscles occur in the walls of the pharynx; the circular muscles form constrictions that help push food to the esophagus and prevent air from being swallowed, while the longitudinal fibres lift the walls of the pharynx during swallowing. Reference: britannica.com, dictionary.com, wikipedia, therespiratorysystem.com.